When Time Warner was formed 27 years ago, it was the largest media conglomerate in the world -- a colossus that seemed to stretch the modern conception of how big a media company could be, and helped to shape the landscape of such companies today. Since then, Comcast has merged with NBCUniversal and Verizon has acquired Yahoo. The future is no longer about content synergy, the people who run these companies think, but rather about how to combine distribution and content. Enter AT&T's $85.4-billion acquisition of Time Warner, which would create a company capable of producing and distributing content across satellite, broadband and wireless. If that seems daunting, it's worth remembering that the history of Time Warner has been a story of consolidation, de-consolidation and re-consolidation that largely maps and explains broader changes in the industry. It is hardly the first time the company currently known as Time Warner has been at the vanguard of such changes. In 1989, Time Inc. agreed to a merger with Warner Communications, creating the largest media conglomerate in the world with a starting stock market value of $15.2 billion. The merger, much like the AT&T-Time Warner deal now, was portrayed as a seismic media shift, radically altering the industry. John Reidy, a Wall Street analyst, described it as "mind-boggling." "What you've got is a company that will be the largest magazine publisher in the country, the world's most profitable record company, a cable television entity with more than 5.5 million cable subscribers, one of the world's largest book-publishing operations and the country's largest supplier of pay-cable programming," Reidy told The New York Times. 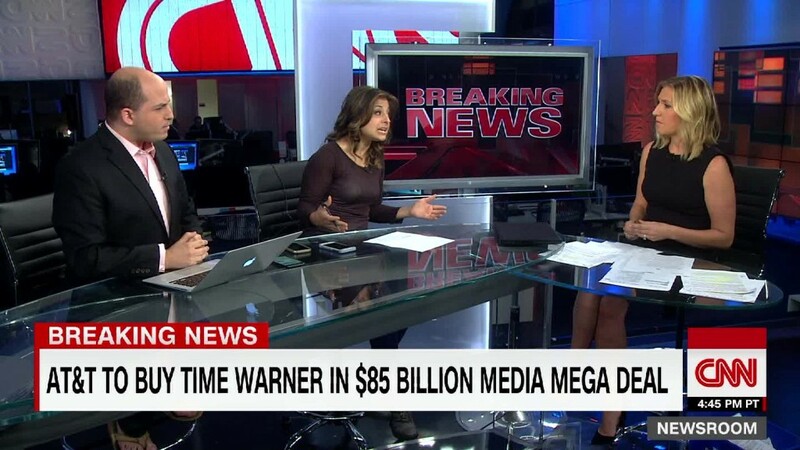 Seven years later, Time Warner acquired Ted Turner's Turner Broadcasting System, including the channels CNN, TBS and TNT. By the dawn of the 21st Century, at the height of the Dot Com bubble, it seemed like the internet was going to render existing media companies like Time Warner irrelevant. Seeking to adapt, Time Warner agreed to be purchased by Internet provider AOL for a whopping $350 billion -- the largest business merger in American history. Just as Time Inc. and Warner had brought together publishing and broadcasting, so Time Warner and AOL believed they could meld legacy media with digital. "This is a historic moment in which new media has truly come of age," AOL co-founder Steve Case said at the time. Should AT&T's Time Warner acquisition survive the next year of regulatory scrutiny -- the companies say they expect to close the deal by the end of 2017 -- it will reverse that trend. "Premium content always wins," AT&T Chief Executive Randall Stephenson, who would serve as the top executive of the new company, said over the weekend. "It has been true on the big screen, the TV screen and now it's proving true on the mobile screen."